4.0 out of 5 based on 41 bloggers and 13 commenters. 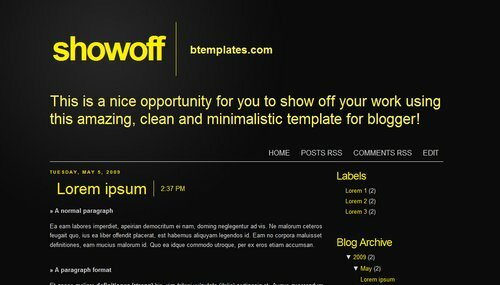 Showoff is a free blogger template with 2 columns, right sidebar, minimalist and neutral colors. Cool design… I like the use of big typography! wow i love it, thanks! Really cool. Thanks for sharing it! Muchas Gracias se ve bien bonito!!!!! cool stuff,but in IE the “This is a nice opportunity for you to show off your work using this amazing … ” is looking very wired (just load the theme in IE and you’ll see).Is there any solution for this problem ? I have to agree. In IE.8 the message “This is a nice etc…” looks very weird. Please, any solution? Thank you. It’s a nice template and I love it. how do you change the color of the title and text? I can’t find it in the html. This is a great template. But how do I change the text colours?